Shana ended up having a great race that day, running a 50-mile PR of 9:33. But this story is not about her race — it’s about her journey. When Shana LeNeveu was growing up in Greeley, Colo., her doctors told her that she would never run. Asthma was still relatively rare at the time. “There were only two medications, and the doctors just kept increasing the dosages. It was just so much medication for this little body.” The side effects increased as the medications did, and nausea and the shakes were a daily problem. Though she had to stay away from running, Shana stayed active as a young adult as an avid skier. By the mid-90s, thanks to excellent doctors and great improvements in asthma medications such as inhaled steroids, she was able to run-walk her first marathon in San Diego. Her time of 5:35 was nothing to write home about, but Shana had caught the running bug. In addition, she noticed something peculiar. Unlike most runners who are exhausted by the end of 26.2 miles, as she neared the finish line “I felt like I was just getting started,” she remembers. But, life happened and running took a backseat. Shana had two beautiful boys, Jack and Garrett. Concentrating on her career in human resources, raising her sons, and still managing her asthma, Shana struggled with being consistent in her training. Conditions like hay fever or common colds that’d be minor for a “normal” person would wreak havoc on her lungs, forcing her to resort to oral steroids with strong side effects. “I felt like I’d start [running] and have this passion and then just stop when life or my asthma kicked in,” Shana said. It would be almost ten years before Shana ran another marathon again. Under Cindy’s tutelage Shana found herself being pushed further than ever before, and the hard work began paying itself off. In their first six months together she set PR after PR in all different distances: a 2:02 half marathon in March 2010, 4:20 at the Big Sur marathon on her 40th birthday in April, a 1:53 half marathon in June, 4:02 at the Steamtown marathon in October. In May 2011 Shana broke the 4-hour marathon barrier, running a 3:47 Colorado Marathon — and unwittingly garnered herself a coveted Boston qualification. Well trained? You could say so. Shana won the women’s race that day — in her first ultra, less than two years after running a 4:43 marathon. Race after race went by, including that JFK 50. “Every goal I achieved, I celebrated – because it was more than I thought I could do, ever,” Shana said. 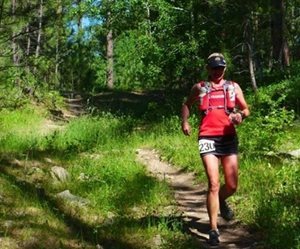 Come August 2012, Shana would take on her biggest challenge yet: her first 100-miler, the Lean Horse 100 in South Dakota. Shana’s goal was to complete the punishing 100-mile course in 24 hours, but the day was cooler than expected and as the race progressed it became clear that she was exceeding the pacing strategy set by Cindy. However, she was within her target heart rate zones, so Shana ran on and targeted heart rate limits instead of pace. She finished in 21 hours and 19 minutes, nearly 3 hours faster than expected. More importantly, she came in second woman overall — and set the seventh fastest course time by a woman in the race’s history. Cindy, who had run the 50K earlier that day, paced her client in for the final 10 miles and the two crossed the line together. Only three years after she’d taken on the sweet, self-effacing woman who was running a 10:48-mile marathon at the time, she was pacing her across the finish the line of her first 100-miler — in second place. “Consistency is the key for asthma,” Shana goes on to explain. “I’ve always focused on controlling it – that’s what the doctors always said. But for me what works better is consistency in my running. It’s similar to training a weak muscle that you have to strengthen every day. TrainingPeaks would like to thank Shana LeNeveu and Cindy Stonesmith for sharing their story. For more information about Cindy Stonesmith, visit www.ultrarunnertraining.com. This athlete story is part of our November “Dreaming Season” series. Read more about Dreaming Season here. Gloria Liu is the Content Editor at TrainingPeaks. She's also a mountain biker, snowboarder turned skier, seasonal yogi, recovered financial analyst, huge eater, and lover of all things endurance. Read more from Gloria at alpenglo.wordpress.com, or follow her on Twitter @thats_my_line.